In earlier newsletters we discussed the proper use of the TM, SM, and ® symbols. 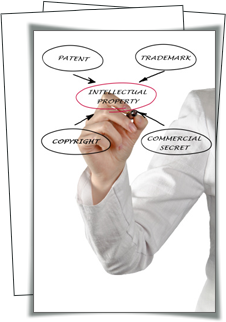 To recap, TM stands for "trademark" and is used to indicate that you claim ownership of a mark that is used for goods but that is not yet federally registered. SM stands for "service mark" and is used to indicate that you claim ownership of a mark that is used for services but that is not yet federally registered. ® is used to indicate that your mark is federally registered for the goods or services for which you are using it. If your mark is not registered and is used for both goods and services, we recommend using the TM designation. What happens if I fail use the TM or SM symbol for an unregistered mark? There is no requirement to use the TM or SM symbol, and in most cases there are probably no bad consequences for failing to do so. In the U.S., common-law rights in a mark are obtained by "using" the mark in conjunction with the provision of goods or services. If you use the mark for the provision of services, and are not infringing on another's rights in the mark, then you are obtaining rights in the mark. Nevertheless, we generally advise using the TM or SM symbols for unregistered marks because it explicitly notifies the public that you claim ownership of the mark and because it may dissuade some parties from adopting your mark. What happens if I use the ® symbol for a mark that is not yet registered? If you use the ® symbol for a mark that is not registered for the goods/services you are providing (which includes federal applications that are still pending), you may expose yourself to claims of fraud and/or you may not be able to successfully enforce any rights you actually have in the mark if you ever attempt to enforce them. What happens if I fail to use the ® symbol for a mark that is registered? If you fail to use the ® symbol for a registered mark then the consequences don't come about unless you attempt to enforce your mark against another party. While you may still be able to stop another's use of the mark, you may not be able to recover lost profits or money damages from another party unless you can show that party had "actual knowledge" of your registration before they began the infringing behavior. You do not need to overuse the TM, SM, or ® symbols on your websites and documents, we generally recommend at least one conspicuous use, if possible the first time the mark is used on a site or document or on the most prominent display of the mark. We recommend placing the symbol either in superscript above and to the right of the mark or in subscript to the right and below the mark.